Supreme clarity. Schecter know a thing or two about sound quality. They started out making world-renowned pickups long before they started applying their excellent technology to produce their own guitars. The company are experts at getting the absolute best sonic delivery out of their instruments. The Reaper-6 FR is testament to this. Schecter Diamond Decimator pickups, usually used on models that cost a lot more, are perfect heavy metal guitar pickups for providing lots of gain and attack. They maintain a beautiful clarity of sound and keep feedback to a minimum, meaning the audience only hears exactly what you intend them to. The Cure, Avenged Sevenfold, and Black Veil Brides have all turned to Schecter to provide top-notch hard-rock sound quality. Make sure you do the same. Blistering speed. There's nothing holding you back with the Schecter Reaper-6 FR. That's because it's been fitted with an ultra-thin maple and walnut multi-ply neck to give you an exhilarating, pacey playing action. The thin shape means you can move up and down the neck rapidly and with ease, and the wood's slick quality makes the playability incredibly smooth. Channel the legends of metal, and shred and solo with tremendous pace. A guitar that looks distinctive and extremely cool. All eyes will be on you if you're holding a Reaper-6 FR. Its sharp aesthetic is perfectly suited to the hard rock genre. A stunning satin sky burst finish adds an explosive dimension to the overall style. The intricate patterns of the finish will have you gazing at this awesomely attractive instrument for hours. This is a guitar to ensure you get all of the attention when you're on stage. Make your bandmates jealous. Say goodbye to hand cramp. The Reaper-6 FR's "C"-shaped neck fits comfortably into the palm of your frethand. This means that your hand will always feel in a natural position at every point up and down the guitar's neck. You won't suffer from soreness or strain, meaning you can play on for hours and hours. Furthermore, the guitar features a bevel-edged top where your strumming hand sits over the body. This will give you greater access to your guitar's strings than ever before, adding even more comfort to your playing experience. Thanks to this, the Reaper-6 FR is perfect for long practices, studio sessions, and gigs that go on long into the night. A guitar that's crying out to be taken on tour. Schecter have crafted the ultimate live heavy metal instrument with the Reaper-6 FR. Its powerful sound and immense playability make it a complete package. But it's no use having an instrument that sounds and plays brilliantly if it's not tough enough to withstand life on the road. That's not something you need to worry about with the Reaper-6 FR. 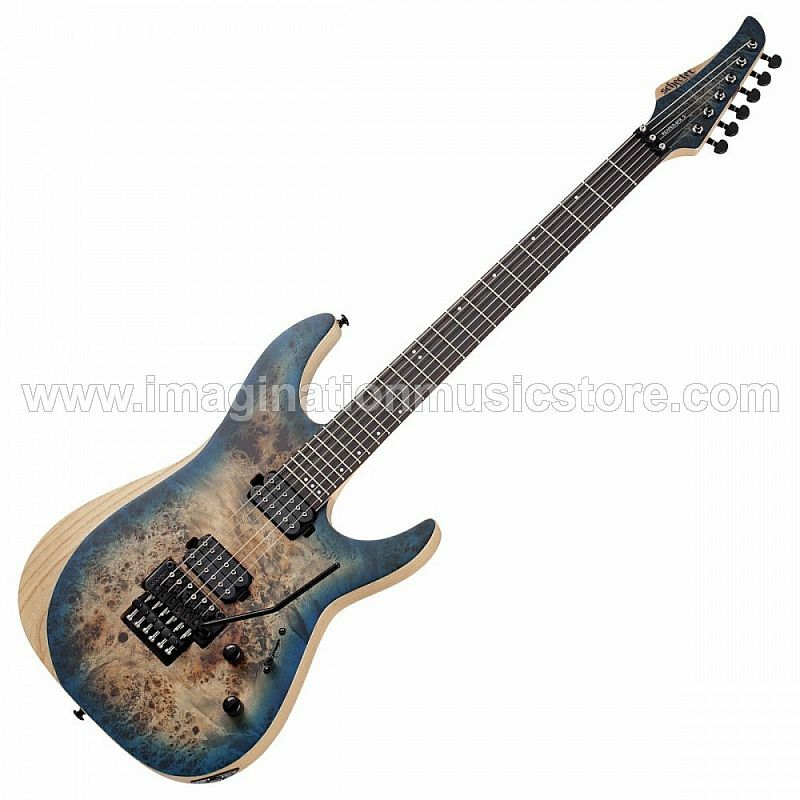 Schecter have ensured that it's extremely strong and durable. Carbon fibre reinforcement rods throughout the guitar's neck make it more hard-wearing and less susceptible to damage such as bending, snapping, or warping in hot climates. You can be certain that it'll survive even the most demanding touring schedule. Experiment with your sound to your heart's content. The Reaper-6 FR comes equipped with a Floyd Rose 1500 Series locking tremolo bridge. This allows you to inject unique, distinctive pitch bending into your music. You'll be able to give your solos and lead lines an exciting, original edge. You'll stay in tune the whole time, too. Many tremolo bridge systems can cause your strings to drop dramatically out of key when you're using the tremolo effect. This won't happen with the Reaper-6 FR. The Floyd Rose bridge's locking feature keeps your strings consistently in tune. You can use the tremolo as much as you like without concern about your key.